The common, main function of the LINbus nodes in each of the doors is to manage the locking and unlocking. Two of the doors have electrically-adjusted mirror fitted and the driver’s door has the adjustment switches for the mirrors. If the car has electric windows, then they would also be owned by the door node. Stock configuration for locking and unlocking is by the vacuum-operated master locking actuator on the driver’s door. A set of contacts is connected to a pump in the lugage compartment of the car that the applies vacuum or pressure to the other locks via rigid plastic lines. The modified version will remove the physical linkage between lockign knob and lock at all doors, replacing the control rod with a momentary-contact SPDT switch. The door node will monitor the switch and operate the door lock via an electric door lock actuator equipped with a status switch. That switch will be monitored on all doors. The lock actuator switch will change state when the door is unlocked by key. An unlock signal will be used to wake up the nodes in the LINbus cluster if they are asleep. Physical disconnection of the lock knob can be used to frustrate unlocking of a locked door after the car has been locked from the outside. As the SPDT switch on each door will “centre” when not pushed or pulled, the knob can be used to add some extra functionality such as locking only the door with the knob, or, for the front doors, a double press locking all doors. Similarly, a pull on the driver’s door lock knob could be used to selectively unlock the filler flap and/or tailgate if the driver’s door is ajar. Each door’s node will also monitor the door-ajar switch corresponding to the door. Both front doors have electrically-operated mirrors which also have optional heaters. 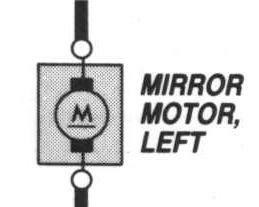 A switch on the driver’s door is used for adjusting both mirrors. In stock configuration, power is provided at terminal 5 and chassis common is at ter minal 1. The mirror selection contact has its outputs at terminals 3 and 4, shown on the left part of the switch above. That combines with the next internal contact and the contact with output at terminal 2 to decide which mirrorr’s motor to run, and which direction. 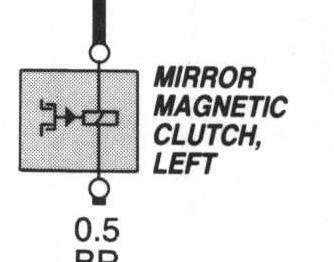 There’s a clutch in each mmirror that turns vertical movement to horizontal. Both clutches are simultaneously energised via terminal 6 when vertical adjustment is required. Mirrors may have have integral heating elements that are energised when the rear window heater is turned on. Decoding the embedded logic of the mirror selection and adjustment switch is one special function that is only required by one of the 4 door nodes, but driving the mirrors is a function of both front-door nodes. Applying a positive voltage at terminal 5 and chassis ground at terminal 1, with the selection switch set to the left results in a positive voltage appearing at terminal 3 and terminal 2 being grounded when the centre contacts are pushed left. If the contacts are pushed to the right, then voltages are reversed. When the up or down contacts close, a positive voltage appears at terminal 6. With the mirror select set to the right, pushing the centre contacts left results in terminal 4 receiving a positive voltage and terminal 2 a negative. Again, voltages reversed when the centre contacts are moved to the right. This however presents an ambiguity as one cannot tell if the unused terminal in either case is open or tied to chassis/positive through teh switch. To remove the ambiguity, terminal 3 is biased high via a resistor and terminal 4 biased low, also via a resistor. “SIgnificant” bias current will flow only if the switch is being used. The node should be modular in layout, especially to accept the additional power stages for the mirrors required only on the front doors’ nodes. e.g. the PCB layout of the nodes should cater for the power stages as they are needed. Wiring requires only 0.5mm2 to each of the “heavy” consumers. Supply and chassis common wires can be 1mm2 when there are no electric windows.